As mandates go, that’s a pretty great one for a rock concert, and Pearl Jam delivered in bulk on that early proclamation by frontman Eddie Vedder last night at the TD Garden. The Seattle rockers ground out a vigorous 2 1/2-hour performance that easily put another notch on their belt of strong Boston-area shows. That was no mean feat, given that Vedder noted this was the band’s 27th performance in Massachusetts. But nearly 20 years on, Pearl Jam remains unfamiliar with the concept of phoning it in. The band also wisely refuses to even flirt with nostalgia, instead opting for a free-range set list that covers all of the bases and the outfield. That spirit also informed the caliber of performance, with Vedder’s flailing passion, Mike McCready’s searing leads, and Matt Cameron’s monster drum fills. From the eased-in opener of “Release’’ to the final fiery encore of Neil Young’s “Rockin’ in the Free World,’’ the quintet, plus touring keyboardist Boom Gaspar, were a wellspring of energy. Vedder was also a fount of thanks, tipping his cap on more than one occasion to the band’s loyal fans. Gratitude is a good look for rock stars; more of them should check it out. 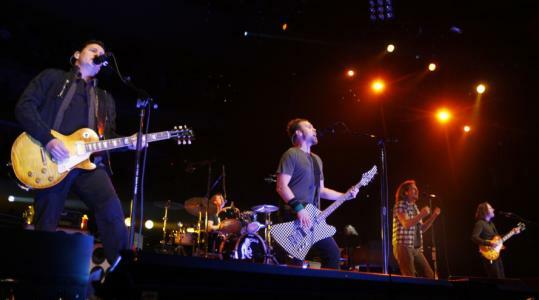 The Pearl Jam frontman also helped enliven the set of openers Band of Horses, adding his voice to a spirited run through “Act Together,’’ the Jagger-Richards obscurity which the ethereal rockers have been jamming on for a few years.